We Love To Sing, Dance & Listen To Music In Our Household. I Have Children's Songs On My iPhone, On The Computer & We Have CD's In The Car As Well! My Children Are Big Fans Of Dancing & We Are Always Looking For New Music To "Wiggle" Too, As My Youngest Would Say! Janessa From Thrifty Nifty Mommy Introduced Me To Vanessa Trien & The Jumping Monkeys Bubble Ride CD & I Couldn't Wait To Play It & See What My Kidos Thought! After Listening Through The Entire CD In The Car A Few Times, I Think Their Favorite Song Is #1-MooMooHeeHawBaaBaaNeigh! My Daughter Has Recently Learned All Of Her Animal Songs, So She Proudly Sings Along To This One! This CD Is Filled With Fun & Cheerful Songs Like Bubble Ride & Deep In The Jungle, Your Children Will Enjoy This Over & Over Again! Vanessa Also Has Two Other CD's Your Children Might Love, Carnival Day & Hot Air Balloon! 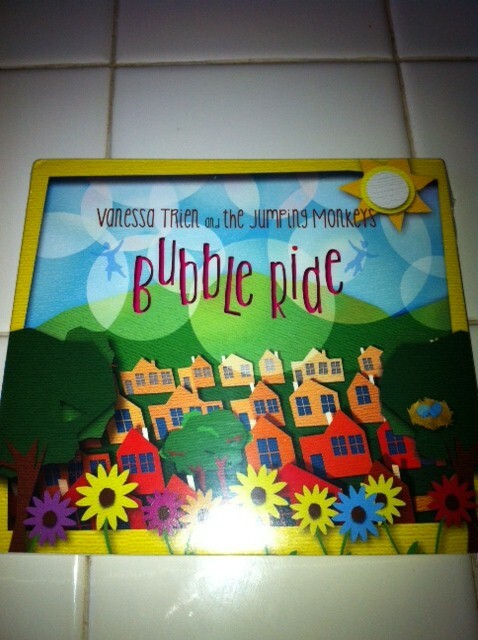 Buy It: Purchase Your Own Copy Of Vanessa Trien & The Jumping Monkeys Bubble Ride CD Online! Win It: One Lucky Reader Will Win A Copy Of Vanessa Trien & The Jumping Monkeys Bubble Ride CD!